Weddings are always special events, whether you plan to have it simple or extravagant. There is no telling that it is one occasion where couples get to share and show their love story to the rest of their families and friends. Such an event would not be complete without a thoroughly and carefully crafted plan, and this is made possible with the use of wedding planner samples and templates. Wedding planner samples and templates will help anyone make their wedding plans become a truly memorable and pleasant one. 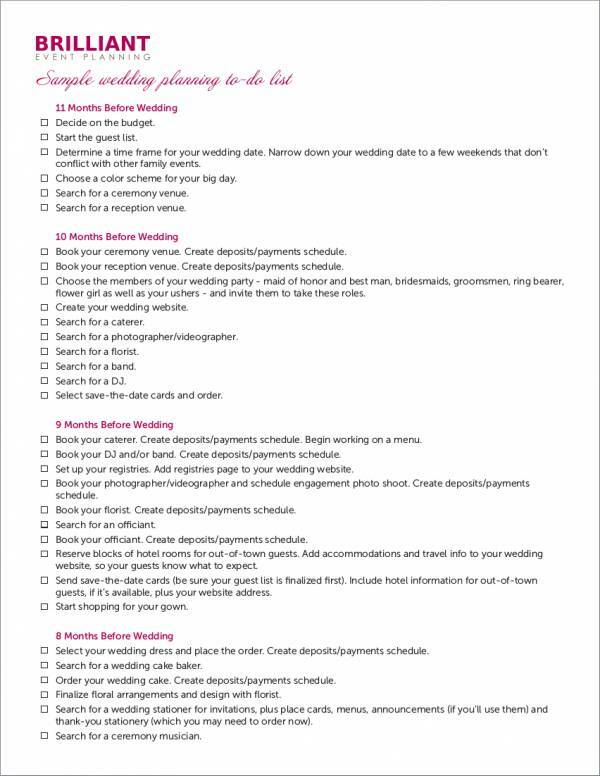 With the use of planner samples and templates, beginners and first-time wedding planners will have it easy and start planning like a pro. There is so much to be thankful for because the mentioned samples and templates are available in this article for free! When you say a wedding planner, most people would refer to it as a person or an individual who offers services to organize and plan for one’s wedding. This is what most people would commonly refer to as the wedding planner business boomed and rose to popularity. There is nothing wrong with it as it is still the right definition, and wedding planners really specialize in planning for wedding events. Another definition of a wedding planner, which is less popular compared to the one mentioned above, is the paper planner. 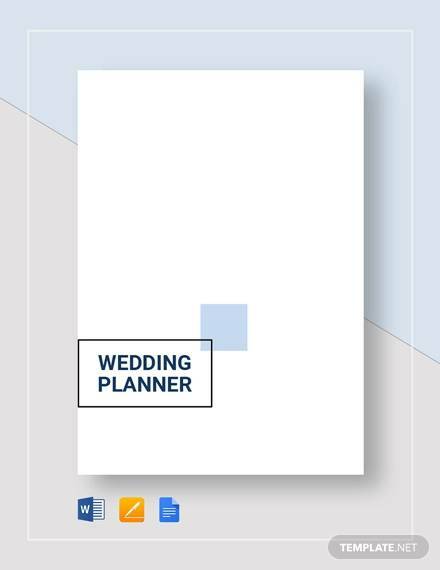 This paper planner contains the details of the plan of a wedding event planner, from the preparation up to the actual wedding day. Some of the activities included or formally outlined in a wedding planner is the scheduling or booking for the church and reception that will be used for the said gathering, the list of guests whom the couple will be inviting, the tableware and giveaways that will be used in the event, the photo shoot, the rehearsals, the fitting of the gown, and the things that will take place during the wedding ceremony. There are still more things to be done and this just shows how important a wedding planner is. Whether it be a professional wedding planner or a wedding checklist, both of them are essential to planning one’s wedding. Even professional wedding planners make use of wedding planners to be able to create the best wedding plan. You just have to choose which option is best for you. You need to weigh the advantages and disadvantages of both options for you to be able to decide. 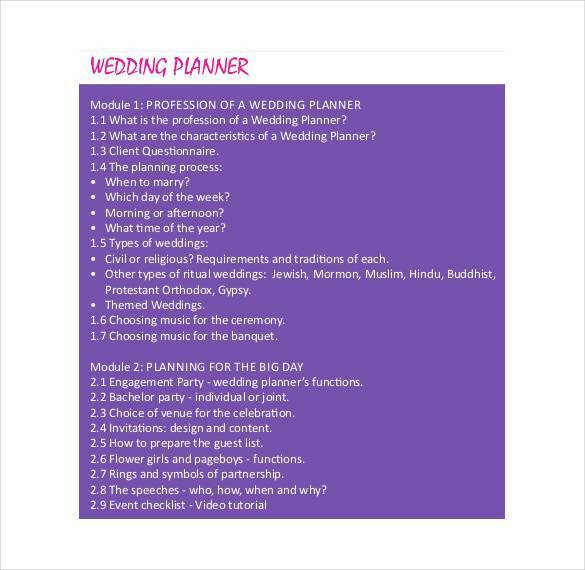 Why Should You Use Wedding Planner Samples and Templates to Plan Your Wedding? Planning for a wedding is not and never will be an easy task, whether you are a professional wedding planner or not. It just appears to be easy when done by professionals because they show you the stress-free planner upfront. You can also like weekly planner samples. They have also mastered the tips and tricks of planning for a wedding through years of experience. But hey, they can’t do it alone. Just so you know, they also make use of wedding planner samples and templates to help them. Here are a handful of reasons why you should use wedding planner samples and templates to plan your wedding. Wedding planner samples and templates will help you plan for an organized and complete wedding. It is still hard to plan the wedding though, but it would be a disaster not to use these samples and templates. Using wedding planner samples and templates will give you an idea of the many different things that are needed for a wedding event program or wedding celebration. 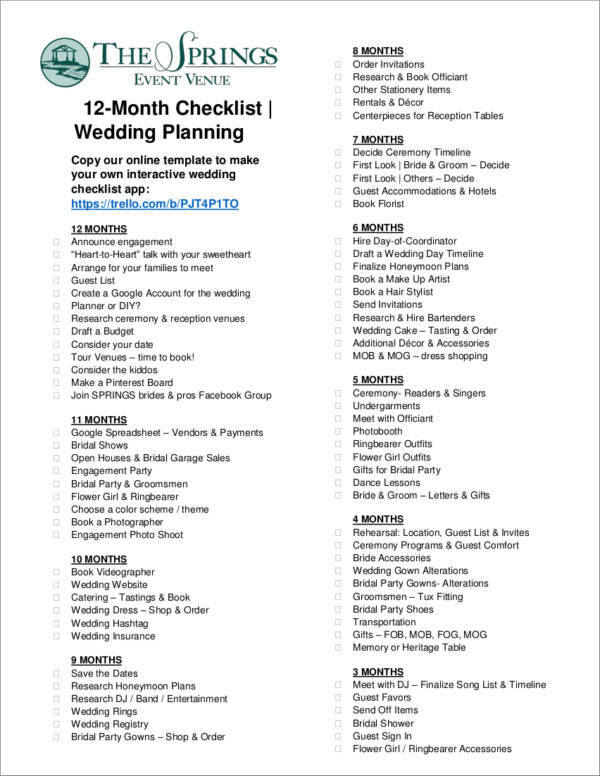 This is super useful for those aspiring to become professional wedding planners or simply to those who would want to put their effort and plan their own wedding. 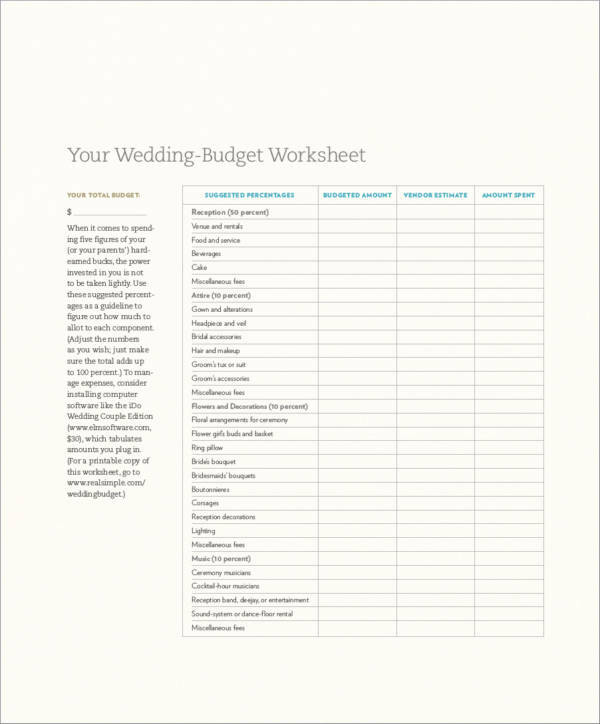 Using a wedding planner sample and template will allow you to save more money. Instead of hiring a professional wedding planner and spend hundreds of thousands, you can use available printable wedding plans and printable wedding checklist samples online. You can make them as your own or use them as reference. True, a wedding is a very special moment in one’s life and splurging would be worth it. However, not all people can afford luxury weddings as much as they want to. Using these samples and templates would save them a lot of trouble. Wedding planner samples and templates will guide you through every process and steps that you need to take toward planning for a well-organized and well-planned wedding. You can organize and customize the wedding that you have been dreaming of. You can also like monthly planner samples. With a wedding planner, you can make sure that you don’t miss out on any important detail, activities, tasks, or requirements that are necessary for the wedding. Wedding planner samples and templates ensure that everything will go smoothly and everything will go as planned on your wedding day. Wedding planners and templates will save you from a lot of stress caused by thinking about the things that you need to do and the things that you should not do when planning a wedding. Besides the fact that planning for a wedding is very difficult, it is also at the same time very stressful. This kind of stress will eat you and consume you until your wedding day. You wouldn’t look good with all those stressful experience. You will look awful on your wedding day and that is a no-no! Wedding samples and templates help you save time and brainpower. How is that possible? With everything laid out just for you, you will only need to spend some time planning and more time doing things that need action. 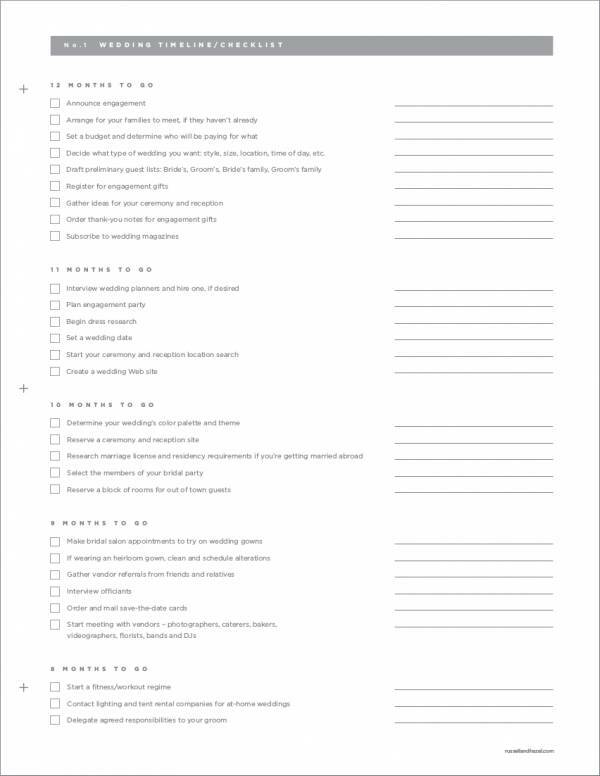 The wedding planner template has it all planned for you. You can also like day planner templates. You want to be creative with planning for your wedding, but you are just not a creative type of person. Creative ideas are not your thing even if you really want them. There is a variety of wedding planner samples waiting for you online. You don’t have to suffer for your lack of creativity. Look for ideas online. If you can find what you are looking for, mix and match ideas to your liking. You will be amazed at how the samples and the templates will help you. Your wedding plan will turn out just the way you want it to be. You can also like agenda planner samples. There is no doubt that wedding planner samples and templates are your ultimate tools for planning and organizing your once-in-a-lifetime and very memorable wedding event. 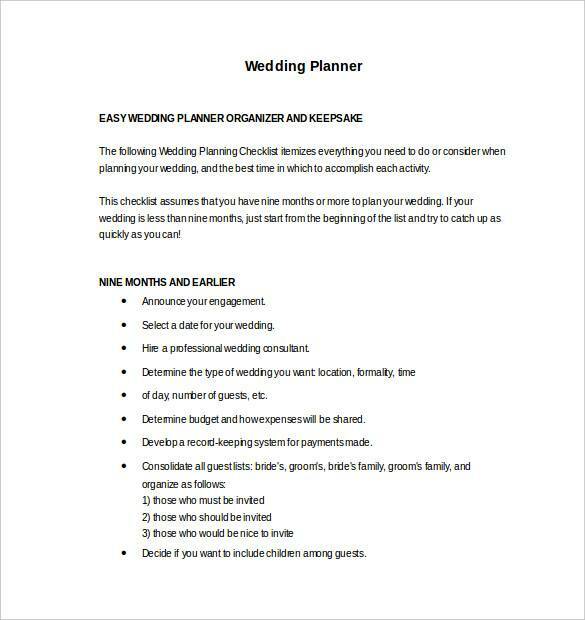 If you are not planning for a wedding event, try checking out our other planners, which includes monthly planner samples and vacation planner samples and templates. What to Include in Your Wedding Program? One of the things that wedding planners do is prepare and create a wedding program for the wedding event that they will be handling. The wedding program will serve as the wedding planner’s guide and the guests’ guide about the sequence of events that will take place in the celebration of the wedding. 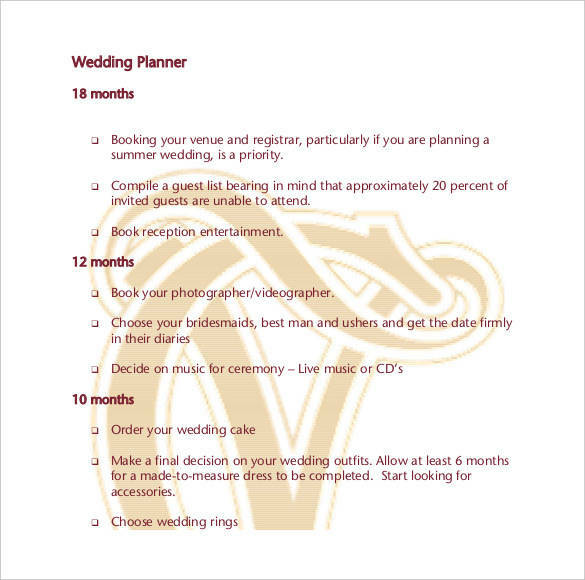 Other wedding coordinators will also use this guide so that everybody in their team follows the same sequence of events and knows what to do for this and that part of the program. Although it is just one part of the entire wedding plan, it is still important that you know what it is and what it is used for. 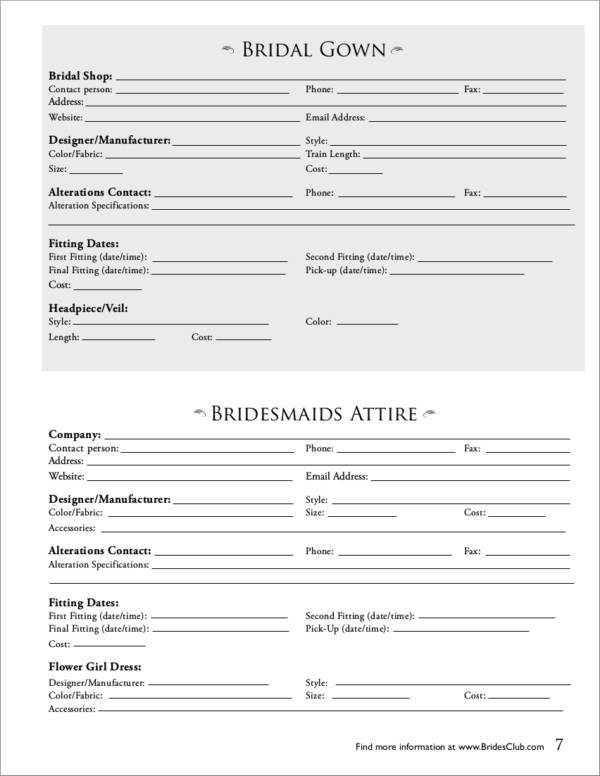 Below is a list of what to include in your wedding program. The scheduled date and time of the wedding ceremony and wedding reception. The places where the wedding ceremony and the wedding reception will take place, if they are done in separate locations. The name of the bride and the groom to be wedded. A theme or design element that is the same or that matches the one used in the whole wedding event. A short but interesting statement or description about the couple to be wedded. You can also like wedding chart samples. The name or names of the guests that the wedding program is intended for. The series of events that will take place in the wedding ceremony in their exact order as planned by the couple. Examples of these events are playing of the wedding theme song, when the music will be played, when the greetings will be done, when then the prayer should be said, the gospel readings, the exchanging of vows, and the pronouncement of the marriage. 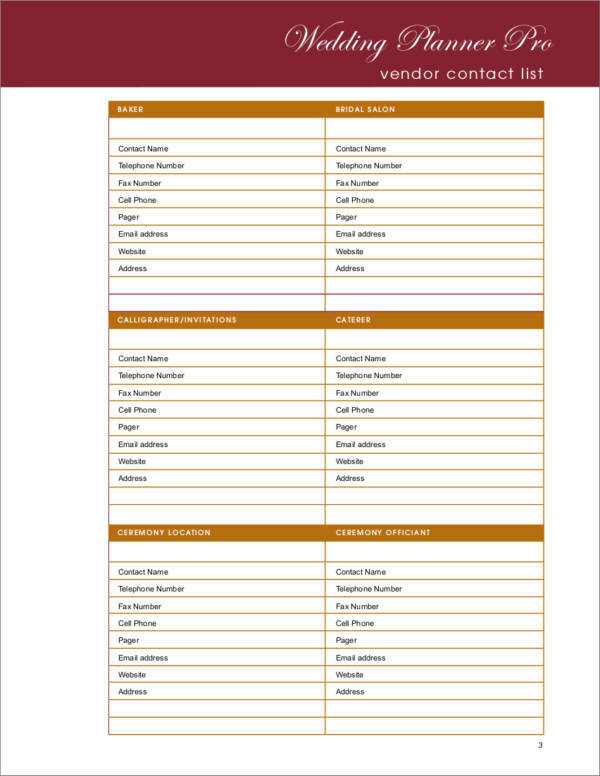 The wedding program template also includes the names of the people included in the wedding entourage and their designated roles. The name of the priest or pastor who will be doing the wedding ceremony or the mass celebrant. Instruction or directions on how to get to the location of the wedding ceremony and the wedding reception. What the guests are expected to wear or the desired dress code for the wedding. And some quotes about love and marriage, but this is optional. There are sure a lot of things that need to be in a wedding program, and if you plan to make one on your own, you can start planning as early as now. You may also want to check out this helpful article about how to design wedding program templates. Looking for program templates but not specifically for a wedding? Try checking out sample program templates on our website. You can definitely find a variety of program templates that will fit your needs. When planning for something, it is always best that you know some useful tips and tricks on how to pull it off, especially if it is something that you will be doing for the first time. This is the same for any event and that includes wedding events. So here are some very useful tips that will surely help you make your wedding plan easy and effective. You can also like wedding chart samples. Tip #1: Plan as early as possible. Planning for a big event, like a wedding, is definitely going to take up a lot of time. Make sure that you plan ahead to make sure that everything will be in place before the wedding day. It is advisable to start planning for your wedding 6 to 12 months before the wedding day. That is a lot of time, but it is just enough for you to be able to plan properly for your wedding. A lot of necessary things can be overlooked if you plan in the last minute. Don’t settle for last-minute planning when you can have a well-organized and well-planned wedding. Tip #2: Mind your budget. The budget is always one of the hardest parts that you will be encountering in planning for a wedding event. Well, if you have enough or more than enough to splurge, then you wouldn’t be worrying so much about what you can and can’t afford for your wedding. But if you want to make your wedding realistic for your budget plan, then it will help if you look for the best wedding deals that are not as expensive but are definitely worth it. What matters most is you’re able to take care of your guests and have an organized wedding event. Tip #3: Take advantage of those who are willing to lend a hand. There are services and help that don’t require payment. Your family and friends would be more than willing to give you all the help and support that they can offer. Why look somewhere else when they are just around the corner. The best thing about getting help from your family and friends is that they become a part of the planning process and the making of one of the most special events in your life. And that is something to look forward to. You can also like wedding registry checklists. Tip #4: Choose your guests wisely. As much as we would like to invite all of our friends and family, and all of the people we know, we just can’t. There are instances when you really have to choose which guests you would invite on your wedding day. When it comes to making tough decisions as such, it is important that you have a criteria or basis on who you should invite. 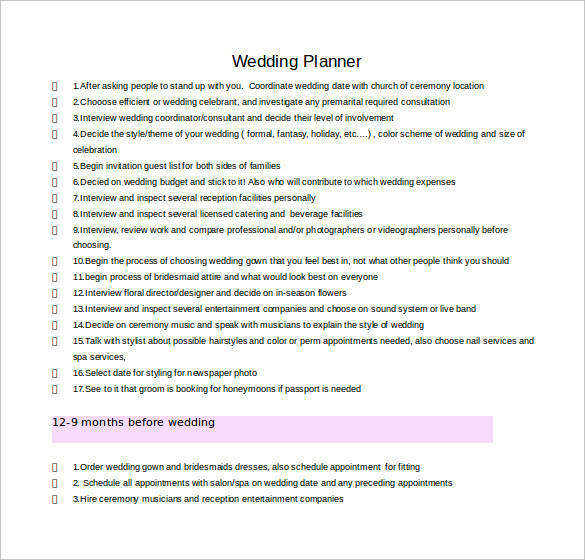 You can also like wedding planner contract samples. You need to be wise in choosing who to invite. Your criteria may include those guests who will surely show up, the guests who will most likely bring you gifts, the guests who can provide their own vehicles, or those guests dear to your heart. There is no right or wrong criteria. It’s your wedding anyway, so everything is up to you. Tip #5: The venue matters. If you’re planning to have your wedding abroad or in another town very far from where you actually live, then you might plan for your wedding at a very early time. You will have to consider a lot of factors, like where your guests will be staying, what will they ride on, when will they arrive at the location, and many more. Regardless if your wedding is nearby or out of town, always provide directions or instructions on how your guests will be able to get there. The address may not be enough, so you can include a map attached to your wedding program or wedding invitation letter, that way it would be easier for your guests to get to where your wedding is. Tip #6: Always have a plan B ready. Even if things go perfectly as planned, it will never hurt to have a plan B ready. Things can happen and they may not always be good, even on your wedding day. Having plan B ready will give you peace of mind that everything will work out just fine. If plan B is not enough and you’re the type who keeps on attracting so much bad luck, have a plan C or plan D ready. Who knows, you might need them. You can also like monthly budget planner samples. Tip #7: Take care of your guests. The best way that you can take care of your guests on your wedding day is to give them a warm welcome, feed them, and make them feel comfortable. Your expensive wedding won’t matter if your guests didn’t feel that they were taken cared of. Tip #8: Share responsibilities with your groom. Don’t carry all the burden all to yourself. You are not getting married alone, so you should share the responsibility with your soon-to-be spouse. It is just right that you work on your wedding together before your wedding day. This way things will get a little lighter and you can both share your ideas and plans for the wedding. You can also like travel planner samples. Tip #9: Always look at the bright side of things. Whenever bad things happen or if unexpected things occur and ruin some plans that you have made for your wedding, don’t be upset and don’t be sad. They are just minor setbacks, but your wedding will still be the highlight of the event. Having a positive attitude will help you in creating a memorable and successful wedding event. Tip #10: Enjoy as much as you can. Perhaps the best thing that you can do to be able to savor every minute of your wedding day is to enjoy. Feel every moment and celebrate with the people you love as long as it lasts. Find planning interesting? Why not check out these helpful planning related articles, like strategic planning checklist samples and templates, event planning checklist ideas samples and templates, and sample project plannings.